I believe a ritual is a little path you follow, winding through your own particular internal woods, and what makes it meaningful is how it resonates to you. The path being as important as the destination. We don’t follow the rhythms of nature any more to survive, but that doesn’t mean we don’t feel them inside like a tide. My intention for this ritual was to name the gifts of the season, show gratitude, say farewell to winter and welcome spring. I wanted to say thank you for the cold, dark days in front of the fire, for the dark bare branches stretched up into the sky, and all the endless ink blue nights of the brightest stars and the biggest moons. What is more magical than an icy, clear winter morning the world sparkling with frost, a full moon setting low in the sky. I used flower heads floated in a shallow bowl with a candle, I placed them with gratitude and whispered to each one a gift of the season, and then when I felt the time was right, I put the bowl in the freezer. I wanted to create an actual thaw. This ritual felt right to be completed in the morning, so the following day, I retrieved my frozen bowl, and set up a small altar, with a dark candle on the outside to represent the winter, the white candle on the inside for the spring, and the flowers of thankfulness suspended in the frozen water. 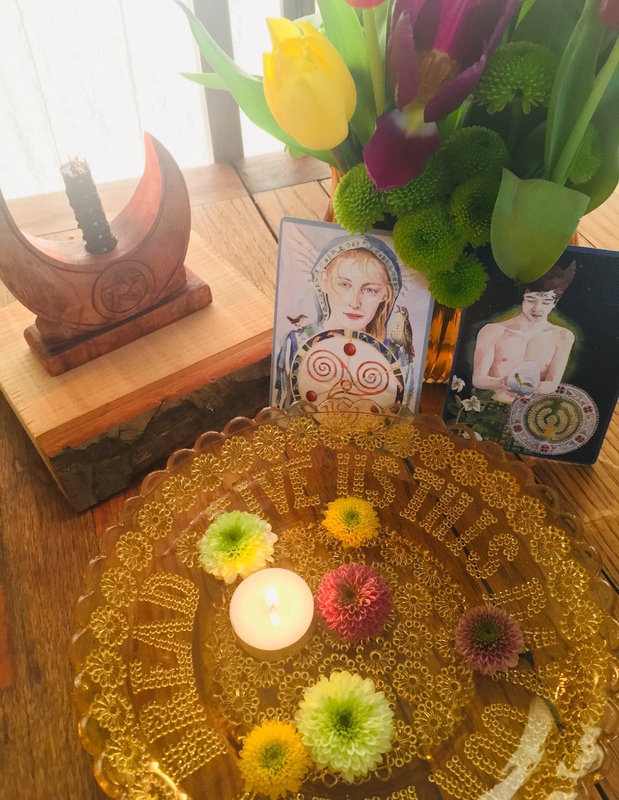 II drew one card which represents Ostara from Danielle Barlows – Green Wheel Oracle and this is The Magician, union of feminine and masculine, infinite possibilities and listening to the whispering voice within. The Magician dares to dream. And, as is often the case when dealing in cards, my next card, pulled at random ended up being the perfect choice, Imbolc appeared, The Maiden, the perfect partner to The Magician and a beautifully balanced pairing of feminine/masculine offering sanctuary and an understanding of placement within the world. One light, one dark. I lit my candles, one light, one dark, and slowly the ice melted, setting my winter free to hide down deep in the dark earth again, until the harvest dancing shakes it free once more. Wishing you a beautiful, bright Ostara. Light a candle, make a wish.